Change is coming to the Emerald Empire, as the Great Clans jockey for position in the Emperor’s courts and on the field of battle. 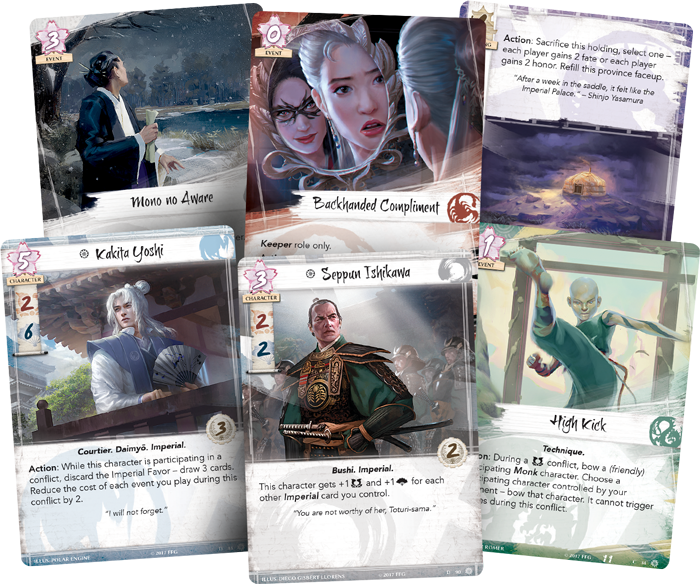 From the opium dens in the City of Lies, to the Wall that still stands strong against the Shadowlands, to the High House of Light in the northern mountains, there are stories being told across all Rokugan—and in Legend of the Five Rings: The Card Game, you have the chance to play a role in that story unfolding. You can pre-order the Dynasty Packs of the Imperial Cycle at your local retailer or by clicking one of the links above, and read on for more information about the release of this cycle! The Emperor has summoned you to court—and for the advent of the first cycle of Dynasty Packs, we are thrilled to announce a special event to grow and immerse you into Legend of the Five Rings: The Card Game in an unprecedented way. Rather than releasing one Dynasty Pack per month over a period of six months, the release schedule for the Imperial Cycle will be compounded and concentrated into a shorter period of time. Beginning in early November, one Dynasty Pack will be released every week for six weeks. During this special event, the meta for Legend of the Five Rings: The Card Game will evolve rapidly, potentially allowing new and exciting deck archetypes to rise to prominence in a matter of days. In addition, the tales of Rokugan told through the fiction included in each Dynasty Pack will see the story of the Imperial Cycle advance from week to week. We can’t wait to journey deeper into the realm of Rokugan every week during this special event, and we’re excited for you to visit the Imperial city alongside us! As you experience the wonders of the Imperial Cycle, you’ll find yourself pulled into the inter-Clan politics and power struggles that define the world of Rokugan. 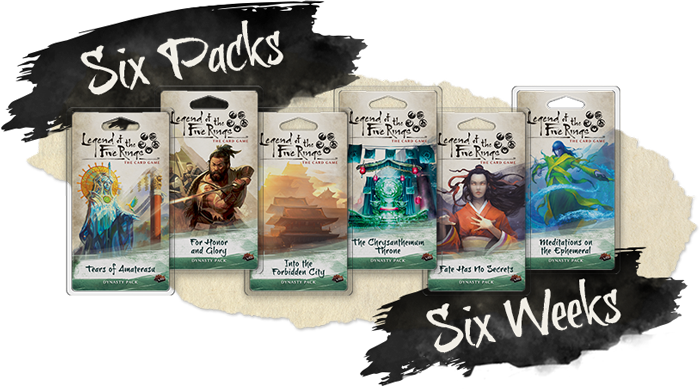 Each of the seven Great Clans receives new cards over the course of these six Dynasty Packs, continuing to embrace and define the themes that began in the Legend of the Five Rings: The Card Game Core Set. Along the way, you’ll find a great assortment of cards focused on the Imperial City of Otosan Uchi. From neutral samurai sworn to the Imperial family, to certain districts of the great city that have an affinity for a certain clan, to Imperial magistrates from each of the Great Clans, to rewards for holding the Imperial Favor, this cycle draws you into the world of Otosan Uchi and the service of the Emperor. Above and beyond the focus on new Imperial cards in this cycle, every faction receives a new Keeper and a new Seeker card in the Imperial Cycle, further playing into the impact of the role cards chosen by the champions and leading players of each clan. These roles were first chosen at the Kiku Matsuri at Gen Con 50—and they will be chosen anew during the World Championships at the Winter Court on November 1st – 5th. The first Dynasty Pack of the Imperial Cycle will release shortly after the Winter Court. Of course, you’ll want to know exactly what you’re choosing between if you’re selecting a Keeper role or a Seeker role for your clan. Below, you can find the fourteen clan-specific Keeper and Seeker cards of this cycle. After the Legend of the Five Rings: The Card Game World Championships is complete, only one of these cards will be legal for your clan to use until the next World Championships. Review your chosen clan’s options below, and prepare yourself for the great tournament at the FFG World Championships! What will you choose for your clan? Are you a Keeper of your element, protecting and guiding? Or are you a Seeker, journeying into new lands and pushing the boundaries of what’s possible? Prepare for the release of the Imperial Cycle over six weeks, beginning shortly after the FFG World Championships in November! Watch our website for individual previews of each of the six Dynasty Packs of the Imperial Cycle!